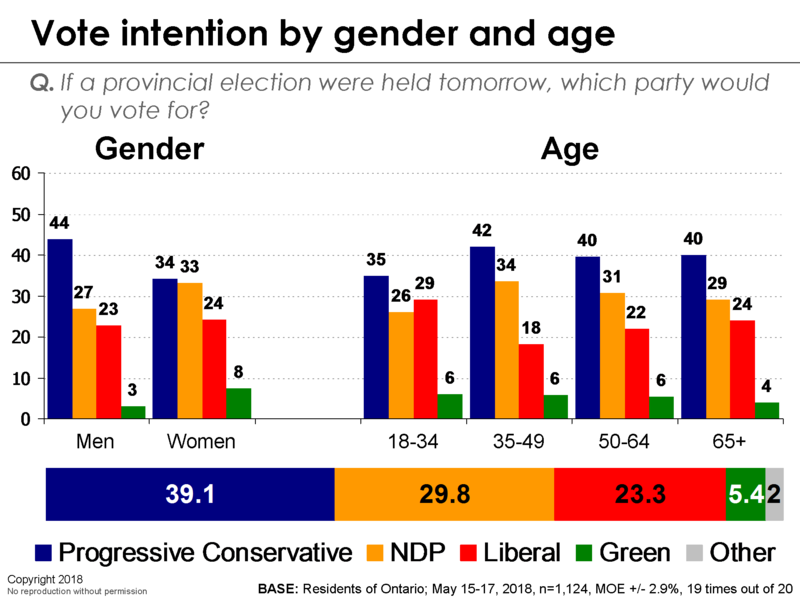 [Ottawa – May 22, 2018] With barely two weeks to go until Ontarians hit the polls, the NDP are picking up momentum with both the Progressive Conservatives and Liberals falling back modestly. If these numbers were to apply to the election, they would almost certainly produce a PC majority. However, the upward momentum for the NDP and the decline of the Liberals bring in the clear possibility of other outcomes. The PCs have a commanding lead with men and they continue to do well with Gen Xers (i.e., those ages 35-49), as well as high school and college educated. The party also has a huge lead with working class voters. This strength reflects some of the key sources for new populist support (for example, the last U.S. presidential election). 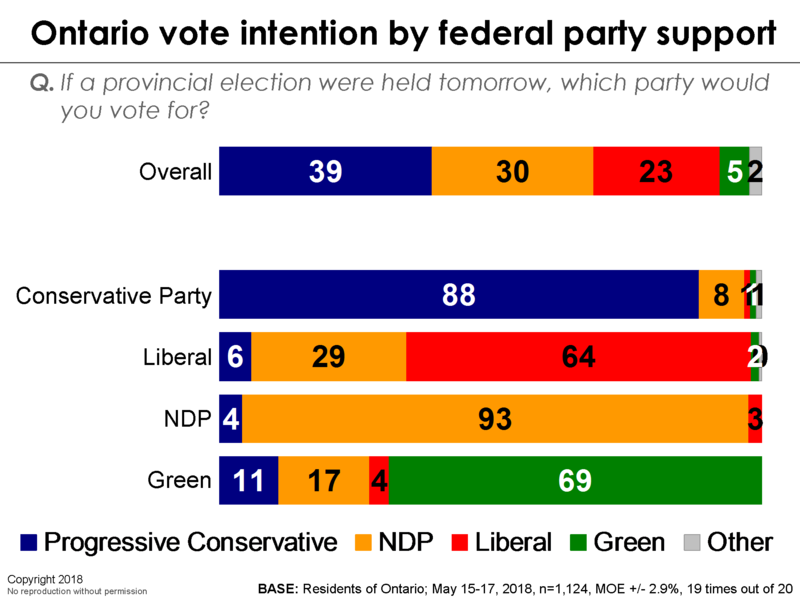 Analyzing the results by vote intention at the federal level reveals that the Ontario NDP and the PCs are capturing the vast majority of federal NDP and Conservative support, respectively. The Liberals, on the other hand, are capturing only two-thirds of the votes of their federal counterparts. 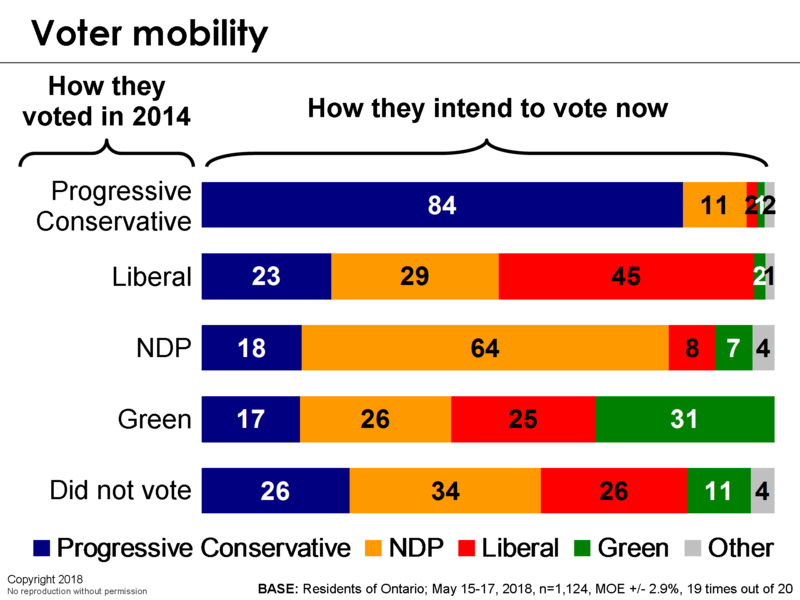 Further evidence of the serious plight of the Liberals is the fact that they are capturing less than half of their 2014 vote (compared to an 84 per cent retention rate for the PCs and 64 per cent the NDP). Liberals defections appear to be going equally to the PCs and the NDP. 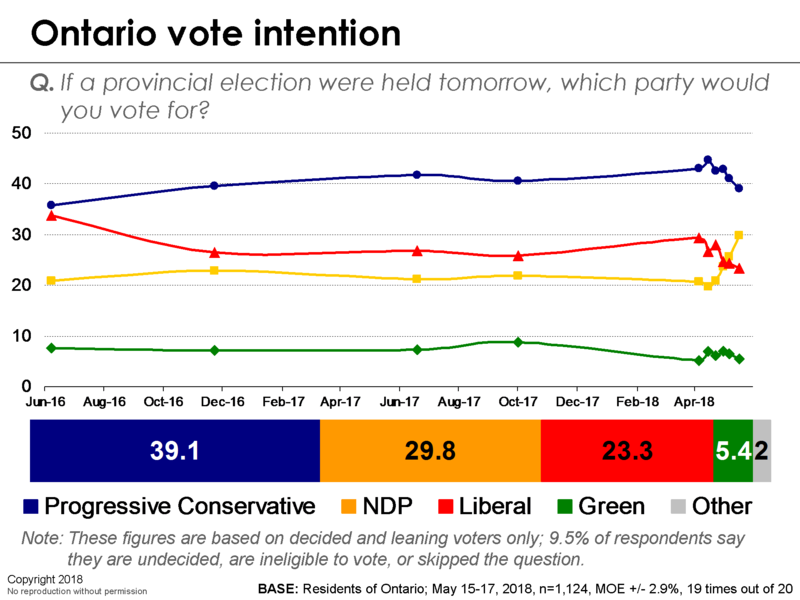 Even though the PCs hold a nearly 10-point lead, there’s lots of room for this election to produce a different outcome that the current polling. Indeed, nearly 30 per cent of voters are at least somewhat likely to change their mind. The PCs hold an advantage in this area, with only 18 per cent expressing openness to changing their minds. 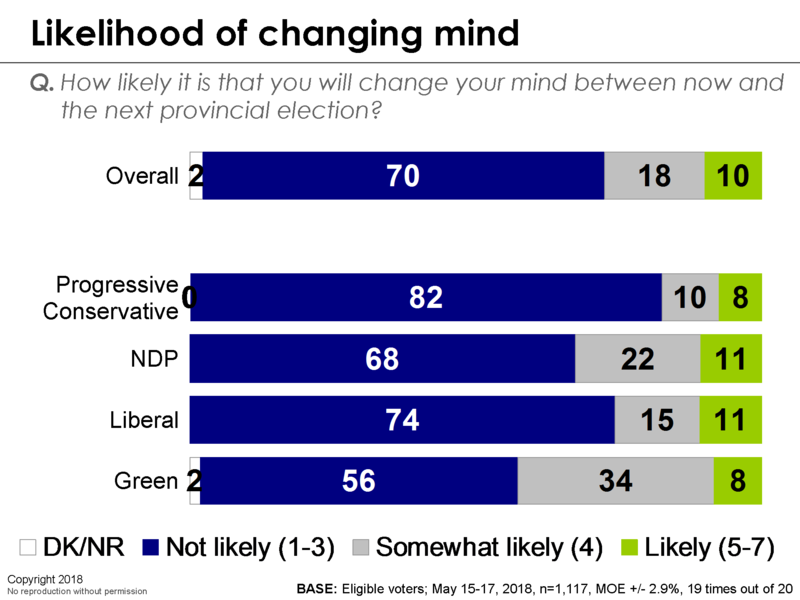 There is also some evidence that the Liberal decline is bottoming out, as they are less likely to change their minds than NDP voters. Another factor that could alter the results is the undecided vote. Making up nearly 10 per cent of all voters, they are a force to be considered. They will likely serve as nothing more than a source of non-voting, but this somewhat lower socioeconomic cohort could make a difference if they become engaged. 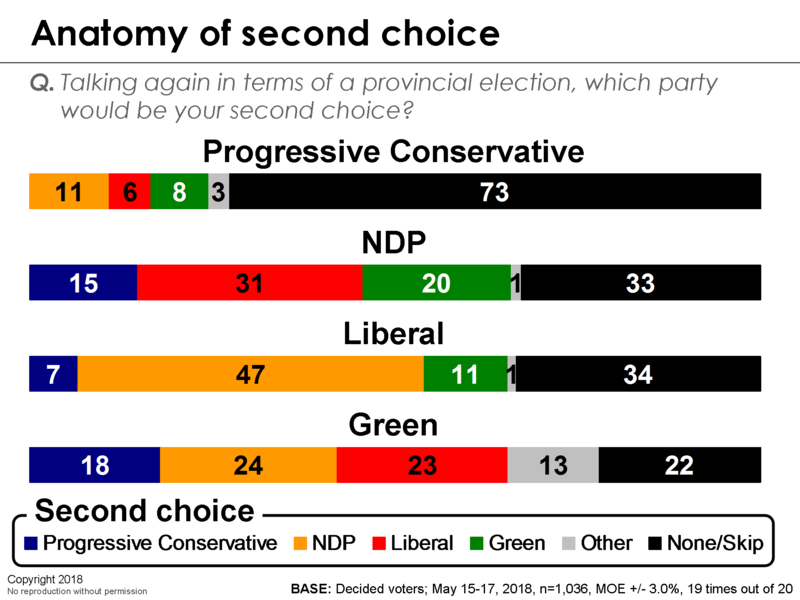 Turning to second choice, both the PCs and NDP have theoretical ceilings in the majority range. Even if the Liberals were to convert all of their second choices, however, they would fall short of a majority. PC voters are much less likely to have a second choice (another indicator of the strength of their commitment). 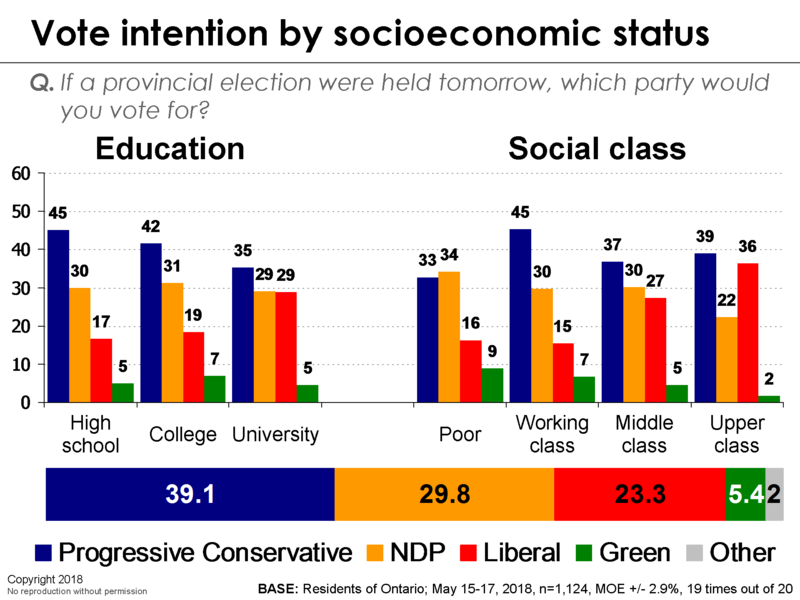 NDP voters, meanwhile, lean to the Liberals as their leading second choice, while Liberal voters lean overwhelmingly to the NDP. It is interesting that the Green vote, which is least likely to turn out, is equally likely to turn to each of the three other parties, meaning it will not be much of a factor. The field dates for this survey are May 15-17, 2018. In total, a random sub-sample of 1,124 residents of Ontario aged 18 and over responded to the survey. The margin of error associated with the total sample is +/- 2.9 percentage points, 19 times out of 20.